Amino acids are the building blocks of proteins. The content of these acids make up 75 percent of the human body. An amino acid is responsible for strength, repair and the necessary rebuilding of the body. When the body doesn't get enough of these essential compounds, it will begin to break down its proteins in search of the nutrients it needs. Thus it is necessary for individuals to consume all the required essential nutrients daily. The brain, tissues, enzymes, and cells get their protection and nourishment from these acids. 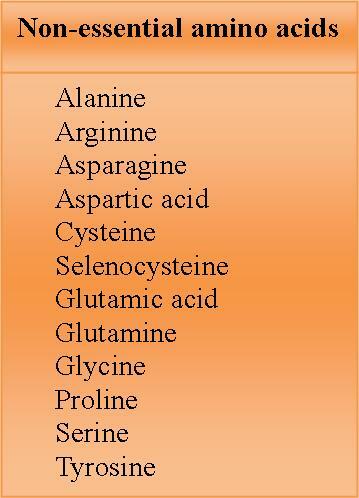 The human body uses 20 amino acids. These compounds are made up of nitrogen, carbon, hydrogen, and oxygen. Out of the 20, nine are called “essential” because the body cannot produce them. The other eleven are “nonessential” because they can be manufactured in the body if the foods in our diet provide enough nitrogen. For the body to function normally, all the amino acids must be present in the diet that we eat. Sources that contain all the nine essential ones are usually of animal origin. These are also known as “complete” or “higher-quality”. Individuals have to take enough amounts to supply the body with nitrogen for adequate production of both essential and nonessential compounds. A deficiency is not a problem in many of our typical diets - from milk to poultry, meat to fish and so on. On the other hand, too much use of animal sources can cause serious health problems. Some people eat twice as much as they need. Animal sources are often high in fat, saturated fat and cholesterol, which can lead to cardiovascular disease, cancer and can also decreases blood enzymes that prevent precancerous cells from developing into tumors. A balanced diet contains a variety of foods from all the five basic food groups, including wise selection of foods from animal sources. Meat should be used more for flavoring than for volume. Further, daily consumption of beef, poultry, or fish should be limited. 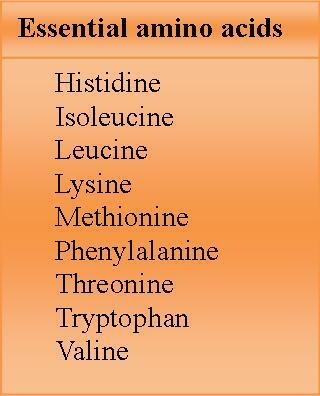 Amino compounds are the basic structural units of proteins. They are bonded together by chemical links-technically called peptide bonds to form proteins. An alpha-amino acid consists of an amino group, a carboxyl group, a hydrogen atom, and a distinctive R group bonded to a carbon atom, which is called the alpha-carbon because it is adjacent to the carboxyl (acidic) group. An R group is referred to as a side chain. Amino-acids are organic compounds which contain both an amino group and a carboxyl group. They are distinguished by the attached functional group R.
Foods with amino compounds are the building blocks of protein. That means they are responsible for strength, repair and rebuilding inside your body. Your tissues, your cells, your enzymes and your brain all get their nourishment and protection from amino-acids. These acids are crucial to health and the proper functioning of our bodies. There are many natural sources of amino compounds that can be included in both vegetarian and non-vegetarian diets. Why do we Need Amino Acids Daily? Amino compounds make up 75% of the human body, and are vital to every part of human function. One of their most talked about properties is how they can assist in muscle building. They are boasted as the key ingredients in many body-building supplements, though the degree of success they achieve in that form is debatable. Careful attention to these acids isn’t just for people who want to build muscle. Different studies have linked amino acid balances with fighting everything from depression to Fibromyalgia. Fat loss involves two major processes that is: 1) the mobilization and circulation of stored fats in the body must increase; and 2) fats must be transported and converted to energy at the powerhouse site of cells, the mitochondria. Several nutrients can assist in the conversion of fat to energy, including lipotropic agents such as choline, inositol and the IAA methionine which, in sufficient quantities, can help improve the transport and metabolism of fat. Plant sources of protein are often deficient in one or more acids. However, these deficiencies can be overcome by consuming a wide variety of plant foods. For example, grains are low in lysine, whereas beans provide an excess of lysine. It was previously believed that, in order for vegetarians to obtain adequate amounts of protein, all of the essential amino-acids had to be “balanced” at each meal. For example, a grain and a bean had to be consumed at the same meal. However, more recent research has indicated that, while consuming a proper mix of amino compounds is important, it is not necessary to consume them all at the same meal. Although most of us obtain sufficient amounts of the essential acids in our diets, there are conditions that require our bodies to need more than they are getting. In times of physical and emotional stress, illness, injury and surgery the body requires more amino-acids than can be gained from food alone, especially when the diet is poor. Many people are also turning away from a meat based diet because of considerations for the environment, the animals, and their own health. For these reasons, it becomes necessary to take a supplement. This can help ensure the body is able to carry out the processes that are essential for survival and can also help to support hair and nail growth, muscle recovery, bone and tissue reproduction, and an overall healthy well being. Some individuals supplement their bodies with amino-acids in an effort to help combat depression and anxiety, or to help with adding or losing weight, while others simply want to ensure their bodies are properly nourished. Some supplements contain only one essential acid while others provide a combination of various these acids. No matter which type of supplement you choose to utilize, you should make sure it has either been formulated or approved by a team of medical professionals to ensure that it provides adequate amounts of the essential amino compounds.